A major aerotropolis has been approved in Bulacan, Manila Bay, the Philippines. The project area spans 2,500 hectares with the airport covering 1,168 hectares and an adjoining airport city. Land reclamation would destroy marine ecosystems and the megaproject threatens the livelihoods of more than 20,000 fisherfolk. Pamalakaya, the national progressive fisherfolk group, vows to oppose the aerotropolis and other infrastructure projects under President Duterte’s Build, Build, Build (BBB) program. Proposed airport in Bulacan | Photo by San Miguel Corp.
Manila, Philippines – The national fisherfolk alliance Pambansang Lakas ng Kilusang Mamamalakaya ng Pilipinas (PAMALAKAYA-Pilipinas) opposes the international airport project in Bulacan that has been approved by the National Economic and Development Authority (NEDA). With NEDA’s approval, Ramong Ang’s San Miguel Corporation (SMC) is set to build, operate, and maintain the P700-billion international “aerotropolis” which involves an airport covering 1,168 hectares and a city complex to be built at a 2,500-hectare area along Manila Bay in Bulacan, Bulacan. For its part, PAMALAKAYA Chairperson and former Anakpawis Partylist solon Fernando Hicap said the project will lead to environmental disaster in Manila Bay threatening the livelihood of more than 20,000 fisherfolk in the municipality of Bulacan, Bulacan and other neighboring towns. A plan for a new airport, one of the largest in the world on a 2,600 hectare site in the Kandal District of Cambodia, with an accompanying ‘Airport City’, has reignited one of the country’s fiercest land disputes. In January the Cambodian government approved a plan for a new airport, one of the largest in the world by land area, on farmland in the Kandal Province, about 30 kilometres south of Phnom Penh. Construction of the new airport is anticipated to commence in 2019 and a 21st December 2017 document from the Council of Ministers approved an investment proposal from Cambodia Airport Investment, a joint venture between the State Secretariat of Aviation (SSCA) and Overseas Cambodia Investment Corporation (OCIC). OCIC is a private firm, one of the largest finance, infrastructure and real estate companies in Cambodia, owned by tycoon Pung Khiev Se, with a track record of financing major development projects. The land area earmarked for the airport project, 2,600 hectares, is more than six times larger than the existing Phnom Penh Airport’s 400 hectares and considerably larger than Beijing Capital Airport, the world’s second busiest passenger airport, with a 1,480 hectare site and handling over 94 million passengers in 2016. Predominantly low-lying agricultural land, the proposed site is on the northwestern shore of a large lake, Boueng Cheung Loung. Preparing the lakeside area of the proposed site for airport construction would require land reclamation and it is thought that there is some overlap with the lake itself. A map produced by GAAM shows the proposed airport site, based on a modified satellite image published in the Phnom Penh Post. The authors of the article were not certain whether the proposed airport site is state-owned or part of OCIC’s vast land bank. The rectangular area outlined in red is the approximately 700 hectare area allocated for the airport, the adjoining shaded area, approximately 1,900 hectares, is earmarked for development of an ‘Airport City’, described by SSCA spokesman Sinn Chanserey Vutha as a mixed-use development including a commercial centre and residential housing. Chanserey Vutha explained that investors will not be able to generate a profit from the airport itself, so the land for the Airport City is being offered to investors for generating profits from commercial centres and other amenities. Announcement of the new airport and associated development sent land prices soaring upwards and within days land for sale signs were hastily erected. Rice fields and lakeside properties in the area that had been valued at between US$20,000 – 50,000 per hectare before announcement of the new airport began selling for as much as US$100,000 or even US$200,000 per hectare. Kandal District villagers were shocked by sudden news of the airport project, along with publication of maps appearing to show the new airport and a massive multi-use development on land they have resided on and near for more than two decades. Their land ownership is disputed by a local ‘oknha’ or tycoon, Seang Chanheng, who has long laid claim to it. A government-aligned media outlet, Fresh News, released documents purporting to show that the land had belonged to Seang Chenheng all along, but even provincial authorities profess uncertainty regarding rights to the land. Regardless of this uncertainty, a large area of disputed land was recently purchased for the airport project, by OCIC in partnership with the SSCA. On 19th February affected villagers staged a major protest. Over 200 people from four communes gathered at Kandal Provincial Hall to voice their complaints regarding land earmarked for the new airport and seek resolution of the dispute with Seang Chanheng. Oeung Sary remained defiant and determined to stay on the land. Refusing to appear before the military police she said “We will not go to answer. If they want to arrest us, let it be” and accused the government of “bias” in favour of Chanheng’s company. Another villager, Sorn An, said she was one of several villagers who had sold land, in her case belonging to her grandmother, to Chanheng’s company but been underpaid, selling it for $250 per hectare but receiving a fraction this amount, just $25 or $50. She said they had been intimidated during negotiation over the land, that representatives of the company had slammed the table in front of them, threatened them, locked the door and called the police. One of the fiercest and lengthiest land disputes in Cambodia has been reignited by the new airport project. Nearly 300 families living in three villages in the Kandal District, still bearing their Pol Pot era names of Point 92, Point 93 and Point 94, have resided in the area for more than twenty years. Before the residents settled upon it the land was uncultivated. Their ownership of it appears to be legitimate on the basis of a 2001 law that people living peacefully on uncontested land for five years can lay claim to it. But in 2005 Chenheng’s men began bulldozing the land in order to claim ownership of it. The villagers achieved a rare legal victory in 2006-7 when the Kandal Provincial Court upheld their claim to the land. Some families were issued with temporary land titles, but the official land titles that they were assured of were not issued. Chanheng’s company began clearing the land again in 2009, bulldozing villagers’ farms and a much loved local temple. Company security guards and Military Police fired on villagers who came to protest, wounding three of them. Prime Minister Hun Sen did not respond to a protest outside his house. In 2010 ten villagers attempting to block bulldozers from destroying their ripening rice crops were arrested and charged with land grabbing and incitement in connection with the protests, a move decried as harassment by human rights organizations. Suddenly, in 2014, the Supreme Court ruled that the disputed land belongs to Min You Cultural Foundation, a company which appeared to be unregistered with no trace of it to be found in Ministry of Commerce records. The Court made this ruling even though it acknowledged “many irregularities” in the sale of the land to this company. Villagers had not heard of the company or the court case or the hearing and were not even called to testify at the hearing. As land disputes erupt again in the wake of the planned new airport, with villagers fearing they will be stripped of their land and evicted, human rights groups argue that development on the land should cease until land disputes are resolved. Vann Sopathi, business and human rights coordinator for the Cambodian Center for Human Rights, said that government and developers should conduct a social and environmental impact assessment of the airport project, and that it should not be permitted to proceed until a mutually acceptable solution is agreed between the company and the affected people. Villagers are not the only people embroiled in land disputes relating to the new airport; several high-ranking officials own land in the Kandork commune which overlaps with the northernmost portion of the proposed site and a group of them complained of encroachment by an un-named Chinese company. Villagers were hired to guard their plots and one woman said she had climbed onto a bulldozer to prevent men digging her employer’s land. Cambodia is beset with a multitude of land disputes due to ambiguities over, and haphazard implementation of, land rights laws. The dispute over the land that is now announced as the site for a new airport is a typical example of tensions between elites with legal claims and villagers who have lived on the land for long periods and whose informal claims are backed by local authorities. Such land disputes are usually settled in favour of people with power and money, as they have the necessary influence and social connections to produce the requisite documentation. The projected cost of the new airport is $1.5 billion. Of this sum, OCIC will invest US$280 million and US$120 million will come from public funds, but the bulk of the funding, $1.1 billion, will come from “foreign banks” that at the time of the announcement remained unspecified. But it is clear that at least a significant proportion of the foreign investment will be from China. OCIC signed a “co-operation framework agreement” for the new airport with the state-run China Development Bank. Chinese financing of the new airport is one of 19 agreements to develop Cambodia’s infrastructure, agriculture and health system, signed on 11th January during a visit by Premier Li Keqiang. The deals were signed by various representatives of the Cambodian and Chinese governments in a ceremony lasting less than 10 minutes. Officials did not ask any questions and few details were given about the agreements, even though they are likely to impact heavily on Cambodia’s future development. At this juncture it is unclear whether the new airport is intended supplement or replace the established Phnom Penh Airport. SSCA spokesman Chanserey Vutha declined to comment on whether the existing airport will be dismantled once the new airport becomes operational. Closing down the existing airport would render the considerable amount of investment in the facility in recent years wasteful and short-sighted. A US$100 million expansion of Phnom Penh and Siem Reap airports commenced in 2014, extending the passenger terminals and parking lots and enlarging the commercial space with more shops and food and beverage outlets. In December 2017, as plans for the new airport were announced, a new US$26 million arrivals hall was inaugurated at Phnom Penh Airport, incorporating extension of the boarding concourse. China has also confirmed financing for a new airport in Siem Reap, a resort town most renowned for Cambodia’s most famous tourist attraction, the Angkor Wat temple complex. The new airport is to be constructed on a 700 hectare site in the Sotr Nikom district 50 kilometres outside Siem Reap city. Groundbreaking, marking the beginning of construction of the new airport, is imminent. The US$880 million agreement with China’s Yunnan Investment Holding Ltd (YIHL) allowing the state-owned company to manage the new Siem Reap airport under a 55-year build-operate-transfer (BOT) concession was actually announced in August 2017, with YIHL reportedly having already commenced land clearance. Double the capacity of the existing Siem Reap Airport the new airport will be able to handle 10 million passengers per year. Number 13 in the list of 19 China-Cambodia development deals is an expressway linking two hotspots for Chinese investment: Sihanoukville and the existing Phnom Penh Airport. Sihanoukville, a resort city on the Gulf of Thailand, is a major destination for Chinese property investment, construction boom in recent years, hotels, casinos and thousands of apartments. China has also invested heavily in Sihanoukville Special Economic Zone, promoted as Cambodian equivalent of the Shenzhen tech hub, with about 100 Chinese firms already operational. The Sen Sok district surrounding Phnom Penh Airport is also a magnet for Chinese residential development and investment. The 190 kilometre highway, 4 lanes wide for most of its length, is expected to cost nearly US$2 billion. It could lead to evictions. Ministry of Public Works and Transport spokesman, Va Sim Sorya, said that the expressway would likely infringe upon people’s homes and land, but that it would be the responsibility of China’s state-owned China Communication Construction Co. to provide fair compensation for affected people, with the assistance of the ministry. The planned new Phnom Penh airport appears to be linked with another road project. An article on the Construction & Property website, which includes a map of the new airport site and a video of the joint Cambodia and China signing ceremony, shows Ringroad Number 3 running through the north of the site. The Cambodian government is building three ring roads around the outskirts of Phnom Penh; construction of the third outer ring road, part of an expressway development masterplan US$9 billion expenditure on 850 kilometres of roads by 2020, is expected to commence in 2018. By land area, the airport and ‘Airport City’ project is an even bigger project for OCIC than its 387 hectare, Chroy Changvar satellite city. The airport project’s US$1.5 billion budget is comparable with US$1.6 billion for Chroy Changvar, which is now under construction and the largest property development in Phnom Penh. A protracted land dispute with residents from six communities, living on and depending upon the land for years, dates back to 1994 when the government banned construction of homes on the land, designating it for development two years later. In 1998 Prime Minister Hun Sen reassured landowners who had lived on the site for a minimum of five years that they would not be evicted, reiterating this in a 2002 speech. A number of residences were duly excluded from the project site. But 200 families were not so fortunate, in spite of being in possession of official documentation proving their land ownership, and in 2016 were informed they would have to accept the compensation offer. In February 2016 100 people representing 359 affected families facing eviction for Chroy Changvar petitioned Phnom Penh City Hall in a bid to resolve the land dispute with OCIC. They urged the government to halt alleged housing rights violations, calling either for higher compensation of US$400 per square metre as opposed to OCIC’s offer of just US$15, or to be given back half of their land, not merely 10 per cent of it as was proposed. In April 2016, in spite of the ongoing land dispute, OCIC, protected by 50 security guards, resumed bulldozing to make way for a new road and drainage system to serve the planned city, in spite of two families laying claim to the land being cleared and one resident stating that she had not been compensated. High security echoed 2014 when security guards stopped an attempt by 40 villagers to stop machinery pumping sand onto wetlands, causing water to rush back into the river, destabilizing their homes and putting them at risk of flooding. Protest continued into 2017, in February 40 villagers gathered to demand compensation for land taken for the new city. China is, by far, Cambodia’s biggest trading partner and and its biggest source of foreign aid, investment and tourists. Backing from China has bolstered the Hun Sen government, the world’s longest serving Prime Minister, since 1985, and its investment increases in the face of a crackdown on democracy, freedom of expression and human rights. Cambodia is regressing to its authoritarian past as a political crackdown silences opposition figures, civil society groups and independent media. Critics are slammed with accusations of treason, defamation, collusion with foreign governments and being a threat to national security. Democracy is in a death spiral. The Cambodia National Rescue Party (CNRP) has been dissolved, its leader Kem Sokha is in jail awaiting trial on charges of ‘treason’ and 118 senior party members have been banned from political activity for five years. CNRP is the only real opposition party, so Hun Sen’s Cambodian People’s Party (CCP) will effectively run unchallenged in the upcoming national elections in July. Human Rights Watch warned of the “death of democracy”. In November 2017 two former Radio Free Asia (RFA) journalists were charged with espionage; still in custody, they could face a 15 year jail sentence if found guilty. They were arrested on the basis of a vaguely worded provision in the penal code criminalizing passing information to a foreign state that could damage national security. Their defence lawyer says the charges against them are baseless and a petition for their release is currently before the Supreme Court. Under the same provision, an Australian film-maker was jailed for flying a drone at an opposition rally. Two former Cambodia Daily reporters were charged with incitement after asking questions during the lead-up to the June 2017 local elections. Both RFA and Cambodia Daily closed down their Cambodia newsrooms after being suddenly issued with enormous tax bills, US$6.3 million with one month to pay in the case of Cambodia Daily, a 24-year old independent newspaper which published its final edition with the damning headline “Descent Into Outright Dictatorship”. A representative of the Committee to Protect Journalists said that the Cambodian government’s arrests and threats against journalists are a “clear and present danger to press freedom”. The tightening grip of repression is also restricting activists. Amnesty International called for convictions against two environmental activists who filmed large vessels off Cambodia’s coast suspected of illegally carrying sand for export. Hun Vannak and Doem Kundy, from the NGO Mother Nature, were sentenced to one year in prison plus fines for this exposé aiming to galvanize action to curb the illicit trade on 26th January 2018. Foreign NGOs have been targeted, for example staff of US-based National Democratic Institute were ordered to leave the country, accused of receiving assistance from foreign governments. As the Cambodian government persecutes citizens and NGOs for collaboration with foreign governments it is bending over backwards to enable China to increase its economic and geopolitical influence. As the 19 agreements for billions of dollars worth of Chinese investment in Cambodia’s infrastructure, including the new airport, were signed Cambodia pledged its support for China’s international goals. Specifically, Cambodia agreed to support China’s claims to disputed territory in the South China Sea, where jurisdictional disputes and construction of ports, military installations and airstrips are straining its relationships with several countries in Southeast Asia. China also gains increased access to Cambodian resources, such as oil, gas and timber, and can take advantage of low tax rates and cheap labour. Critics argue that Cambodia is selling itself short and will pay a price for China’s financial support, warning of ending up in its giant ally’s pocket and already losing its voice on regional issues. Residents of five villages threatened with the loss of their homes for a second airport on Jeju island have set up a protest camp and their resistance is garnering support from many organizations. Plans for a second airport in Jeju, an egg-shaped island off the south coast of South Korea, have met with vigorous and sustained resistance since the sudden announcement of the project two years ago, in November 2015. The proposed site is in Seongsan on the east coast of the island and residents of the five villages that would be affected, losing their homes and farmland – Susan-ri, Sinsan-ri, Nansan-ri, Goseong-ri and Onpyeong-ri – were not even consulted. Resistance has intensified in recent weeks and on 10th October a group of residents and representatives of civic groups opposing the new airport assembled a protest tent outside the Jeju island government hall and began a sit-in. The vice-chair of Seongsan people’s committee against the 2nd Jeju airport project, Kim Kyung-bae, began an indefinite hunger strike and fellow protesters began relay fasting to show their support. The Jeju Provincial Government threatened to remove the protest tent, delivering a warning letter to the organizations protesting Jeju’s second airport, which stated that, if the protest tent was not removed by 17th October the government would forcefully dismantle it and claiming that the protesters are “illegally occupying the roads and causing traffic problems”. Protesters countered that their protest tent is located far enough from the road to avoid causing inconvenience to vehicles or pedestrians, as can be seen in the photo below. Airport opponents only resorted to this sit-in protest because the Jeju Provincial Government refuses to communicate with them and the resistance camp remains, demonstrating protesters’ determination to maintain a visible presence, make their voice heard, and prevent imposition of the project. The photo below was taken on 21st October, marking the 12th day of the anti-airport sit-in and hunger strike. At the time of writing the protest continues on its 14th day, as does the succession of visitors finding out about the campaign and showing their support. Airport plans are being pushed forward without involving the people who would be most seriously affected, the villagers facing the threat of eviction from their homes and loss of agricultural livelihoods. The protest camp builds on a series of small victories, recent actions which have successfully stalled the airport project, blocking a land survey and environmental impact assessment. More recently, on 18th September 2017, demonstrators brought a briefing session on the 2nd Jeju airport to a halt. The briefing session was organized without consulting residents of Seongsan where the airport would be built and held far away in the city of Seogwipo, a distance of about 60 kilometers. More than 70 people, residents from the affected villages and representatives of civic groups, staged a protest, challenging the procedural legitimacy of the briefing session, criticizing it as merely a tool for advertising the project and demanding a complete reassessment of the airport plans. The video below shows protesters gathering outside the meeting with a display of banners, then attempting to take the stage to make their voices heard, only to be blocked by a large number of officials. Over the two years since the second airport plan was announced there has been a series protests and rallies, with the participation of hundreds of people. Most of the site earmarked for the proposed airport, about 70 per cent, is a farming area so the project threatens agricultural livelihoods and food production. If the airport is built over 75 per cent of villagers of Seongsan would lose their homes and other villages would also be severely impacted. Anti-airport actions have drawn on shamanic traditions, channelling a multitude of spiritual energies such as the three founding fathers of the island and Youngdeung, the goddess of the wind and sea. Two years of resistance have seen houses sporting posters in their windows and streets bedecked with red and yellow flags and banners extending as far as 20 kilometers along the roads leading to affected villages. Scores of villagers face being forced to leave their homes and farmland, sustaining their battle against the airport as they persevere with the cycles of rural life. In February 2017, as villagers were busy harvesting radish crops, Kang Wan-bo, chair of the Seongsanup Second Airport Opposition Committee, said that the government had failed to make any concessions regarding affected villagers’ objections and was attempting to force the airport plan through, even though Jeju’s 15 environmental NGO’s had joined forces to oppose it. When Governor of Jeju Province, Won Hee-ryong, made his first visit to the area for a year, villagers told him they felt as if they were being sacrificed for the tourism industry. Kang argued that continuing to expand the tourism on the island would be “ridiculous”, that citizens’ rights and protection of the environment should take priority over pursuit of an increase in tourist dollars. A poll purported to show that a majority of respondents, 63.7 per cent, agree with the second airport plan. But the poll result was skewed because it only offered the two options of agreeing or disagreeing with building the second Jeju airport. Organizations protesting the new airport said that, in order to get a result that is more representative of people’s opinions, a range of options should be considered: building a second Jeju airport, expanding the capacity of the island’s existing main airport or reusing Jeongseok Airport, a facility near Hallasan National Park that is mainly used by private jets. Results of a poll conducted by organizations opposing the second airport showed just 24.4 per cent of respondents agreeing to the second airport. A higher proportion of respondents, 36.6 per cent, supported expansion of Jeju Airport and 20.8 per cent supported reusing Jeongseok Airport. Airport planners and proponents envisage a second airport bringing an enormous influx of tourists to Jeju. But it would jeopardize the pristine natural environment that makes the island such an attractive tourism destination. Honinji Pond, a sacred historical area where farming on the island is thought to have originated, is near the proposed site. In addition the tranquility of a most unusual geological feature, UNESCO protected Seongsan Ilchulbong, also called ‘Sunrise Peak’, a visually striking volcanic cone 182 metres high with a green crater rising from the sea, would be ruined if aircraft flew nearby. A second airport would also support a suite of mass tourism megaprojects. Mainstream commercial tourist traps are in the pipeline, such as retail complexes, casinos and golf courses, along with theme parks and resorts commodifying Jeju’s distinctive ecological assets and unique heritage. Plans for a second airport are also of megaproject proportions. Jeju Governor, Won Hee-ryong, stated that the new airport would be the largest project in the history of the island, costing US$3.5 billion and scheduled to be complete by 2025. Planners envisage a single runway facility with capacity for 25 million passengers per year, equivalent to current traffic levels at Jeju’s existing airport but the airport could be expanded with the addition of a second runway. The airport would be the beginning of and focal point for an even larger development; an ‘Air City’, another term for an aerotropolis, is planned around the airport, comprising shopping malls, convention facilities and financial centres. Anti-airport campaign leaders have voiced concerns that ecological destruction caused by the airport is set to be compounded by urban sprawl from the accompanying aerotropolis. Another tourism-oriented megaproject plan connected with the ‘Air City’ scheme, for a high speed network of rail and bus routes linking the island’s main established and upcoming tourism centres – with the second airport among the key nodes – has raised concerns regarding the environmental impacts of construction activities. Anti-airport campaigners are also concerned that a second airport might be linked with militarization of the island. Many airport serve both civilian and military functions, and in March 2017 former Air Force Chief of Staff Jeong Gyeong-du, said the second airport should have a search and rescue facility (SAR), perceived by some commentators as code for an Air Force base. Military intentions were confirmed in when Air Force Director of Public Affairs, Lee Sang-gyu stated that a feasibility study into constructing an air base would commence in 2018. In 2012 a scheme for an air base near the southwestern tip of the island, using an airfield in Daejeong-eup, was abandoned after a public outcry and the proposal for an air base at the second airport met with equally fierce protest. The Ministry of Transport Plans hastily contradicted the statements made by senior military officials, denying plans for an Air Force base. In spite of these denials and an apparent U-turn many people are still suspicious that a second Jeju airport would be used as an Air Force Base. These concerns have galvanized support for the airport opposition from peace campaigners active in the long-standing resistance campaign against Gangjeong Naval Base – Save Jeju Now. Gangjeong campaigners joined Seongsan residents at the briefing session protest on 18th September, and have made regular solidarity visits to support the current protest camp. Links have been forged between movements opposing overdevelopment and militarization and are becoming stronger. Construction of the enormous naval base in the tiny fishing village of Gangjeong on the southern coast of the island, with capacity for 24 warships, met with a sustained non-violent struggle. A decade of campaigning and direct action, blocking bulldozers and delivery of equipment, at the site entrance and taking to the sea in kayaks, repeatedly stalled construction. Gangjeong Naval Base was approved against the will of the 94 per cent of the village population who voted against it in a referendum. Jeju has a deep rooted culture of peace activism, it is known as the ‘island of peace’, and the naval base goes against this by militarizing the area and strengthening the country’s alliance with US defence interests. Construction of the naval base also caused environmental damage. Unique and delicate marine ecosystems were destroyed with serious impacts on marine food sources such as abalone (sea snails) and fishing livelihoods. Since the naval base became operational, with the first US Navy vessel docking at the facility in March 2017, resistance continues with peace campaigners maintaining a lively presence outside the entrance gates. Gangjeong Naval Base is also linked with expansion of mass tourism; as a joint military and civilian port it is anticipated to begin docking giant 150,000 tonne cruise ships in the near future. The second Jeju airport project is over ten times larger than the naval base and the budget four times higher. But hopefully the scale of the project can be outdone by the strength of the opposition it has triggered. Hopefully the determination of the Seongsan residents who do not want to leave the homes, combined with the convergence of many individuals and organizations expressing support for their struggle, will lead to the cancellation of the airport project. The campaign against the 2nd Jeju airport has a Facebook page. On GAAM’s YouTube channel we are compiling a playlist – ‘Resisting 2nd Jeju airport’, with videos of the many protests and rallies. 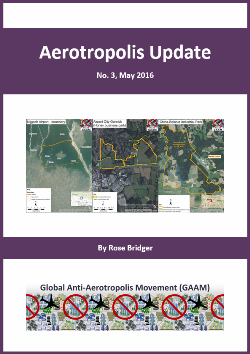 Following extensive research GAAM has published a digital interactive map: Aviation expansion in Indonesia: tourism, land struggles, economic zones, and aerotropolis projects. 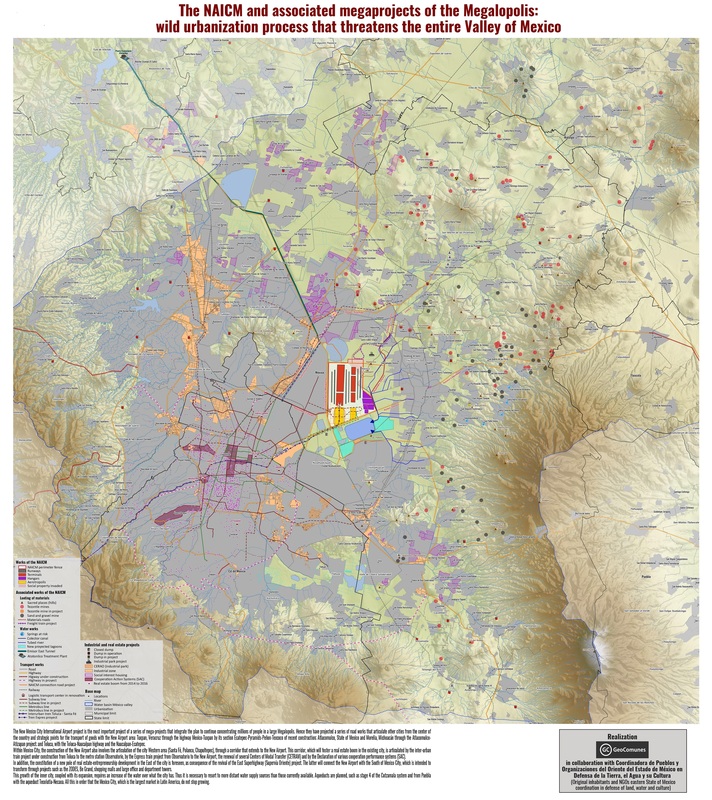 The map includes 60 airports – operational, under construction and still at the proposal stage, plus two airport projects which were cancelled. The issue of land rights in particular is highlighted, documenting disputes and resistance against displacement relating to 25 airport projects. Two airports currently under construction in Java, Kertajati and Kulon Progo, are of particular concern because of human rights violations, including police brutality, against people resisting eviction from their homes and productive agricultural land. 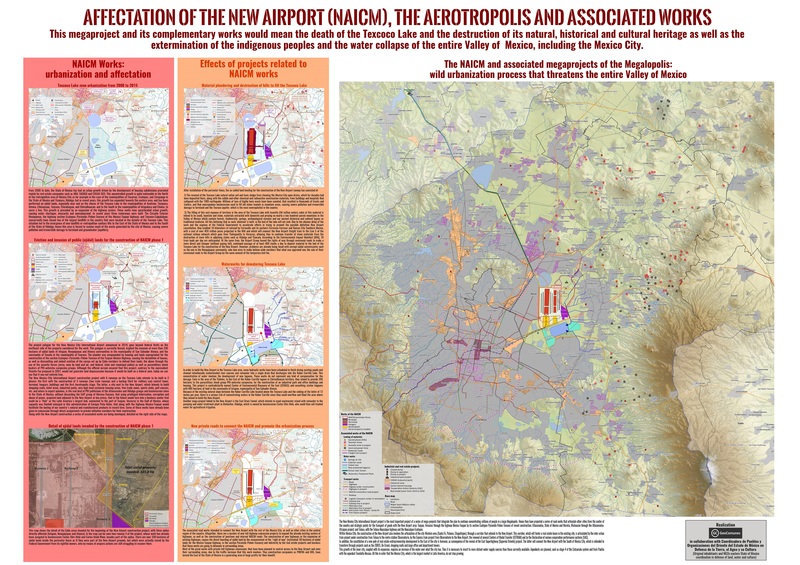 Aerotropolis development is planned adjoining both of these airports. The digital map represents only a fraction of airport projects in Indonesia, which already has 237 operational airports with a government expansion drive aiming for 62 new airports within 15 years, bringing the total number to 299. Yet it demonstrates the exciting potential of online mapping for organizing, analyzing and presenting information. GAAM hopes to collaborate with other organizations in the development of online maps to develop a more comprehensive picture of aviation expansion and the impacts on affected communities, making the most of this wonderful technology to support our research, awareness raising and campaigning. The map was designed and produced by InTouch GIS using the Storymap app. A forthcoming report, Aviation expansion in Indonesia: tourism, land struggles, economic zones, and aerotropolis projects, contextualizes the information in GAAM’s online map, examining the central role of aviation expansion in a government drive for tourism growth and the integration of several airport projects with other infrastructure such as road networks and ports, economic zones and aerotropolis developments. The report will be published by GAAM in partnership with the Third World Network (TWN).